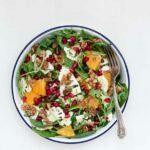 Eat colour with this refreshing and vibrant roasted carrot and farro salad with a tahini yoghurt dressing. Have you ever had a Homer Simpson moment? You the moment when you stand there, palm to forehead, thinking I don’t believe I did that. That is how I was feeling after opening the washing machine and taking out Miss N’s now pinkish, but meant to be white, uniform shirts. I mean, I actually put in the whites, threw in her maroon cardigan, added the detergent, set the temperature for 60 and pressed go. You would have thought that at some point I would have realised what I was doing and stop. But oh no. Cue a lot of face palm movements and a panic filled shopping trip with some rather grumpy kids late on a Sunday afternoon to replace the entire set. I have a feeling that I will be a lot more careful in the future. Doooooooooooh. What I did get right though is the vibrant colour in this roasted carrot and farro salad with a tahini yoghurt dressing. 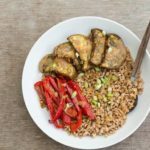 It is tasty, colourful, packed with flavour and can be mostly prepared ahead by cooking the farro and carrots the day before. I think you could easily sub in some sweet potato for the carrots and add more nuts or seeds as you prefer. And to make it gluten free, sub in some quinoa for the farro. 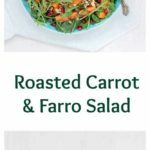 I hope you make this farro and roasted carrot salad and enjoy every colourful mouthful. 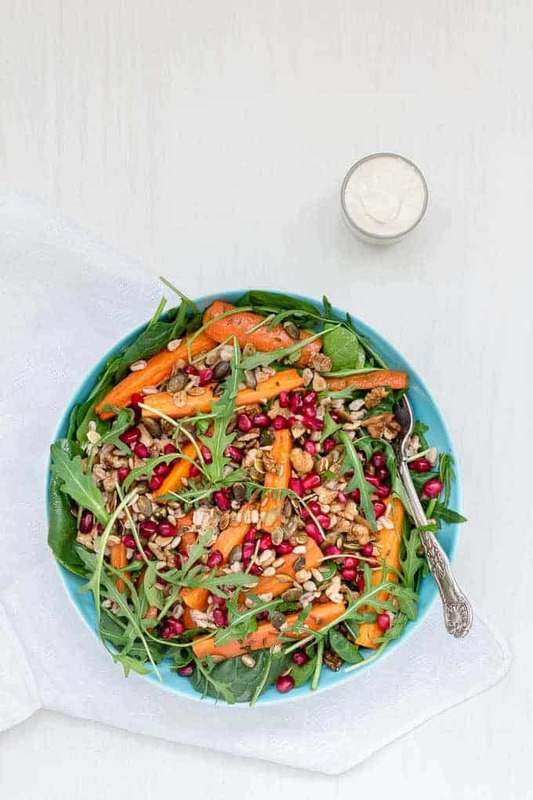 This roasted carrot and farro salad with a tahini yoghurt dressing first appeared in Superfood Summer Vitality issue in 2016. Don't forget to tag #recipesfromapantry on Instagram or Twitter if you try Roasted Carrot and Farro Salad With A Tahini Yoghurt Dressing! It is really, really awesome for me when you make one of my recipes and I'd love to see it. You can also share it on my Facebook page. Please pin this recipe to Pinterest too! Thank you for reading Recipes from a Pantry. Cook the farro according to the packet instructions and set aside. Mix the carrots with the olive oil, cumin seeds and salt and transfer to a roasting tray. Roast carrots for 30-35 minutes turning half way through, until tender but still with a bit of a bite. Remove the carrots from the oven and allow to cool. 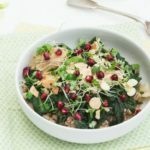 Make the tahini yoghurt dressing by whisking together all the ingredients. Add a little water if the dressing is too thick. Mix together the carrots, farro and the rest of the salad ingredients and serve with the tahini yoghurt sauce drizzled on top. I’m never actually tried Faro before so I’m really intrigued. Loving all the colour in this! What a beautiful salad and I love that you used tahini. I am always looking for ways to use it. Such a gorgeous salad! I love all the colors and the flavors sound incredible. This is such a pretty colorful salad!! It looks delightfully delicious! It is a perfect meal for this summer heat. 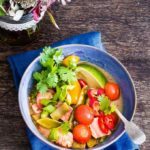 Exactly right – eat light but eat colour. That is a gorgeous looking salad. I bet it tastes great too. Pinned it. TY – appreciate the share. I love grain mixed with greens!! It’s such a beautiful, tasteful and filling salad!! I hate laundry accidents too, as if doing laundry wasn’t hateful enough! I’ve never heard of farro before, so I guess I know what my weekend assignment is going to be! gorgeous gorgeous colors! What a gorgeous, colorful and healthy salad! 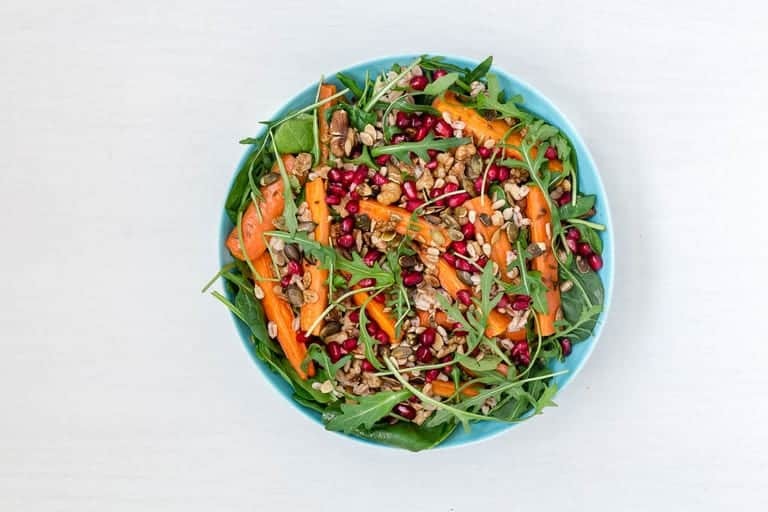 I love roasted carrots in my salad and you can never go wrong adding pomegranate to anything! Exactly – pomegranates just rock. How yummy! I just bought farro but didn’t know what to do with it yet. I’ll try this!! Feel free to use other grains that you are more familiar with. This salad is beautiful I love the colors ! and the addition of pomegranate is such a great idea! What a beautiful looking salad. Love roasted carrots, and the addition of the pomegranates is awesome. Which recipe plugin are you using? How do you get the long image in the recipe card? Easy recipe plugin in and the pin is in pic monkey. Wow, this carrot salad is so colorful and looks so healthy! LOVE IT! Such a lovely summer salad! I love tahini dressing and add it to my tomato salad all the time! Wow this looks beyond amazing! and nutricious too! Great work, thank you for sharing!! I didn’t even have to scroll Bintu. That first photo had me hooked! I will eat whatever it was! 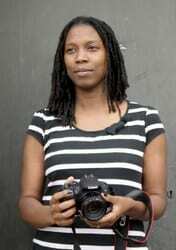 You take amazing photos. And what a lovely salad too. This looks delicious! I love trying new salads. That is a beautiful looking salad, and I am a big fan of farro. The dressing sounds lovely too.